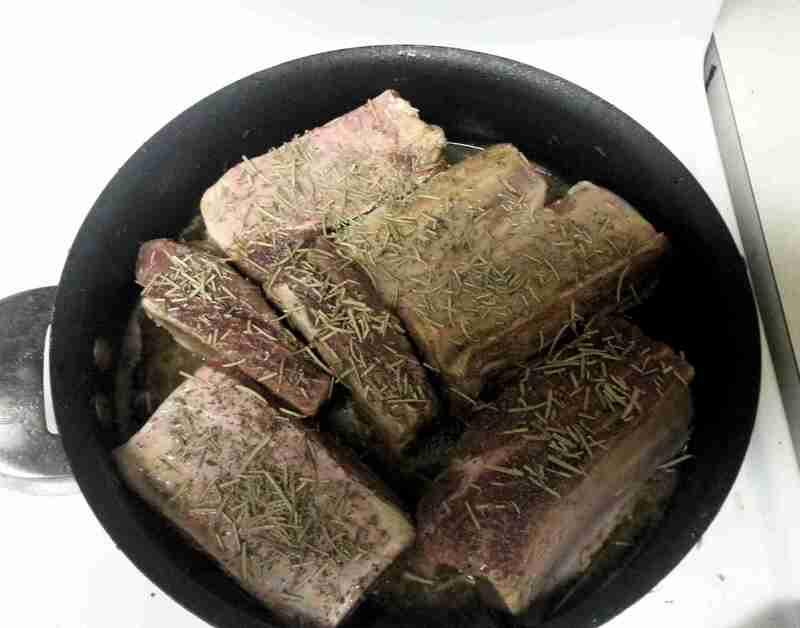 Begin cooking the Beef Short Ribs before preparing the salad. This is mostly because this will take some time to cook, and you may as well be preparing the salad while the beef is working it’s way down. So, this is quite simple: Add all of the ingredients to a large fry pan, cover with a lid, and turn on medium-low (about a 3 on a 10 scale) heat. Let this cook for a good 20 minutes undisturbed before uncovering to let it boil down. 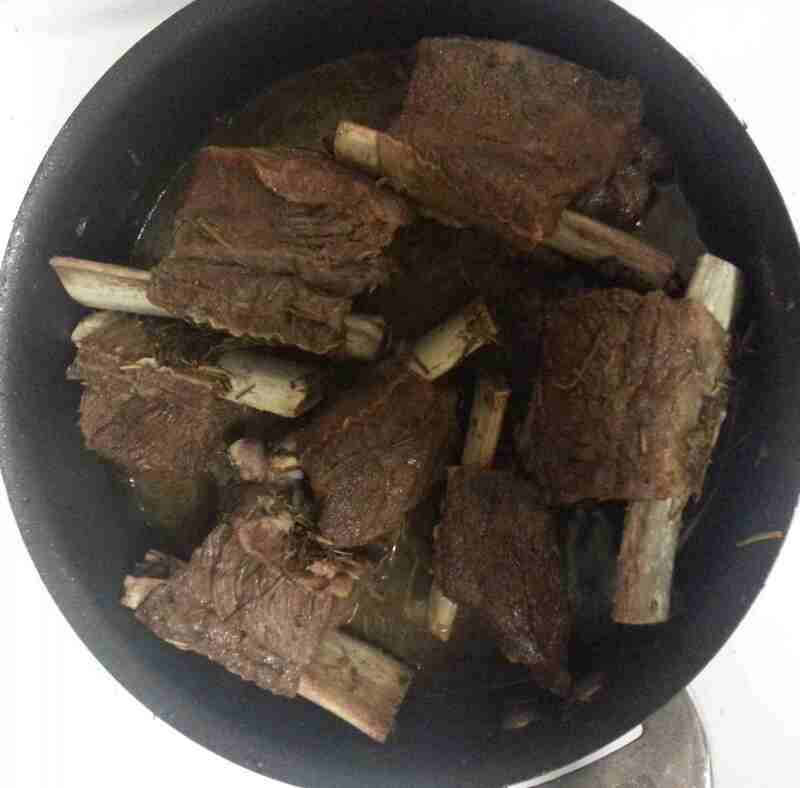 Stir once when you uncover, and again every 3-5 minutes, just to make sure that the ribs are cooking through evenly. Total cook time should be between 30 and 40 minutes. You will know it’s nearing being done when the sound of the cooking changes, from the sound of water boiling down to the sound of the oil sizzling in the pan. At this point, I like to keep the ribs in just a little longer, and let them get a touch of crisp on them. I think the crispy carmellized rum flavor is great! But if you don’t like that flavor, you can take them out as soon as all the liquid has boiled off, and there is only oil left. As a note: the more rum you use, the better the final flavor will be, but the longer it will take to make. Do not ever use more than 1 cup of rum (or any alcohol) per pound of meet. This will be very similar to other toasted veggies I have made. I really like the flavor effect when I quickly heat up some vegetables in coconut oil before serving them. I heat them just enough to bring out the sweetness in their flavors, and to ease their texture from a fresh, crisp texture to a more calm soft texture. Well, with these carrots, I use a bunch of young carrots, with the stems still attached. Cut the stems off, just above the tip of the carrot, leaving just a bit of green on the carrot. I don’t think this will change the flavor directly, but I think it looks better in it’s final form, and better looking food tastes better too!! Now slice each carrot one time, making the cut as long as you can, but not down the center of the carrot – you need it to be diagonal. Your finished product should have a definite head on one piece, and the cut should leave the carrot almost as long, but not quite, as the original length. 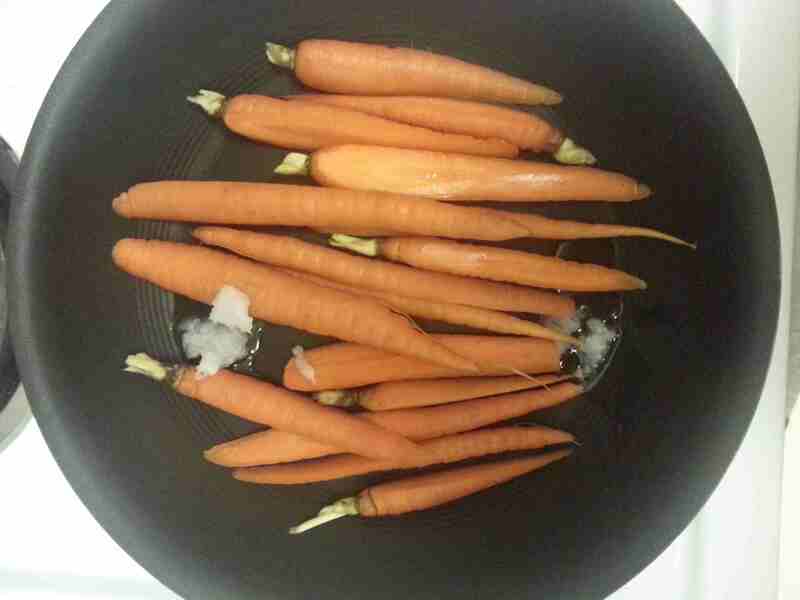 Put the carrots in the coconut oil and heat on high for about 5 minutes. 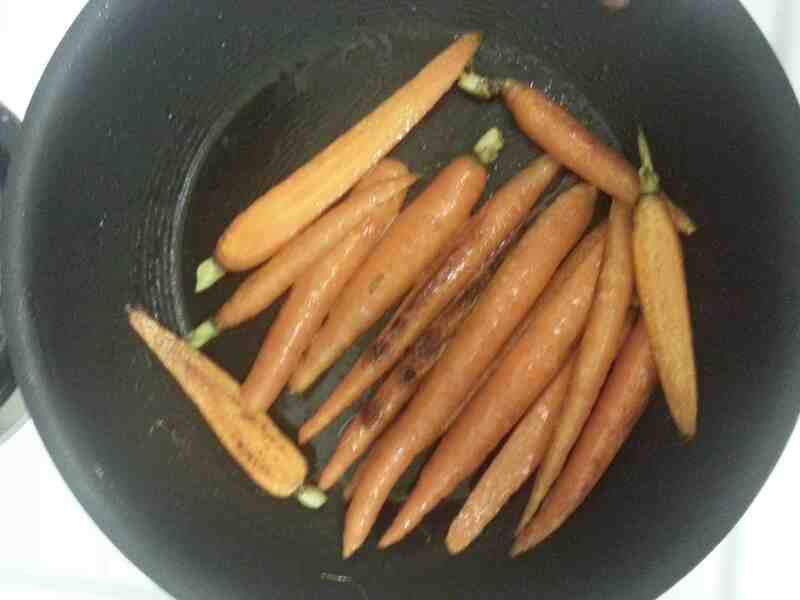 You want to just slightly caramelize the carrots, so heat them up on high. You will want to stir a bit to make sure that nothing burns. And pay close attention to these carrots – you don’t want to overcook them. And since the carrots are all cut only once, the thin end of the carrots will be more likely to overcook, so pay attention while they’re cooking. Add the cucumbers to the plate first. As a note, you could use a UPC’s Side Salad with arugula, parsnips, celery, lime juice and olive oil instead of the cucumbers. I think the salad will be a great compliment, without taking over the dish. I wanted sliced cucumbers for this meal, but if you’re in the mood for a salad instead, go for it! 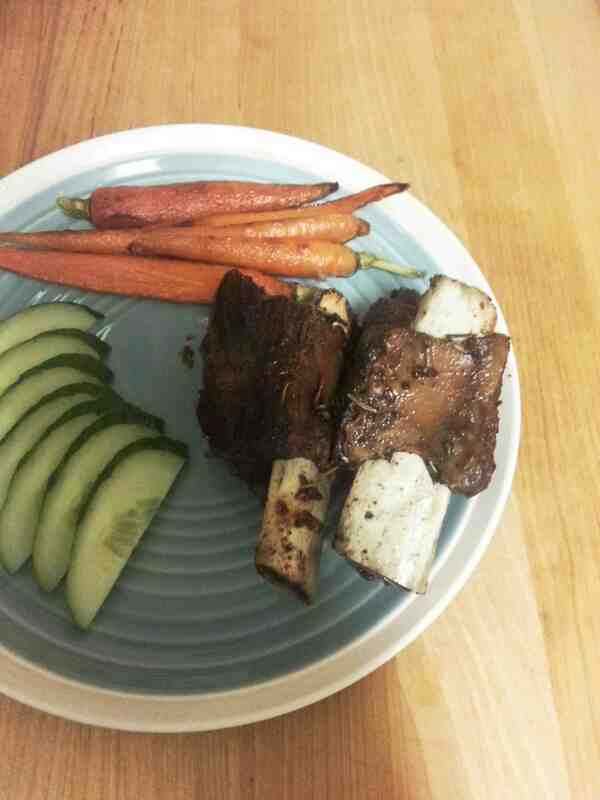 After the salad, add the carrots, and then the beef short ribs, and enjoy! For more meal ideas, be sure to check out the Recipes Page and the What’s For Dinner? Page. Also, check back here daily for my Urban Paleo Chef “What’s For Dinner” posts!